Why would I choose your pool company to build or design our project? What makes you qualified to be in my backyard? How long has your company been in the pool industry? Why would I choose your company over my current provider? I’ve had this pool service for years and they do an adequate job. We take pride in the fact that every client and every job is not for us. You will want to choose our company for design, construction, and maintenance services only if you want the highest level of standards, professionalism, communication and reliability. You can very easily look in a phone book and hire the first “contractor” you see that knows what a “swimming pool” is, and that is usually the process people take because our industry has not taught the public any better. The amount of “pool guys” and “pool builders” is astonishing considering how few licensed, quality professionals are out there. Modern Watershapes only associates with the highest respected members of individual trades: tile, plaster, steel, concrete, waterproofing, etc. for one reason: we demand perfection. If your project is something you want done ASAP at the lowest price point possible we are not the team for you. We are interested in projects where the clients want a quality product and truly care about the reliability and security of not only the structures and plumbing of the project but the finishes and longevity of the surfaces. The only way this can be delivered is by using true professionals which is all that we use. Modern Watershapes is not only state licensed and insured, but we take every possible effort to continue our education in the industry as it changes and evolves. We are active participants in highly respected educational groups such as Genesis 3 Design Group, Artistic Resources and Training, and many others. 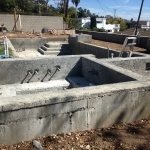 Modern Watershapes is licensed by the LA County Health Department and is capable of handling anything from large commercial water environments to quaint backyard water features. Modern Watershapes is a new name to and old face that began as JMAC Pool & Spa Service has been in the swimming pool industry since 2009. We began in the maintenance of small residential pools and spas and have grown to providing maintenance and construction services for over 200 clients in the South Bay. From small residential pools and spas to large, $450 million dollar resorts such as the Terranea resort in Rancho Palos Verdes — we have seen it all. We are proud to take care of some of the most complex and valuable watershapes in the area and our reputation speaks for itself. Hiring a professional pool cleaning service to provide routine maintenance extends the life of your pool.